“Who goes to Siwa for three days?” a local asked me. Well, me. And my 20 new friends. I could see the Siwan local’s point, though. 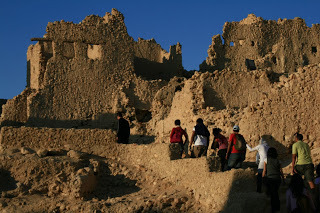 Siwa is an oasis in Egypt’s Western Desert, just 50km from the Libyan border. To call the road journey there a slog is an understatement: it took us 12 hours with stops to cram chips and juice, tea and dodgy croissants at all-night road stops along the route that heads up toward Alexandria till you turn a sharp left and keep on driving another nine or 10 hours. We left Cairo on the Thursday night before Eid Al-Adha, the Feast of the Sacrifice, which I wrote about two blogs ago. The holiest of prayers is on the Friday morning, so at first light, we pulled up in front of a crumbling, empty mosque in the middle of nowhere. The adaan had turned the reverb up on the loudspeaker, and while some prayed, the rest of us slept in the bus or, like me, wandered in the cold desert night to stretch our legs and listen to the chill wind. The second stop for prayers was an hour later, in another roadside mosque near Marsa Matrouh, this time a makeshift affair with screens up for the women to pray in, while the men lined up behind the old building. 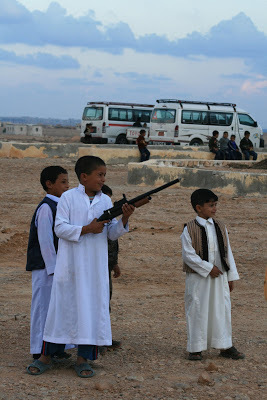 As we pulled up, we saw dozens of Bedouin families rolling up in trucks or walking across the highway from a cluster of shacks to pray, with an improbable amount of young boys in white gellibayas with black waistcoats over the top, shooting each other with their Eid toys, mostly semi-automatic rifles and machine guns. By the time we got to our hotel, Siwa Gardens, a hessian sack on a concrete floor would have sufficed. But the spring-fed pool and pretty domed ceilings (natural air-conditioners, they’re cool in summer) made up for it all. After a swim and shower, we headed out on the town. The oasis comprises the main town, built around the crumbling mudbrick Shali fortress, and a scattering of villages amongst the palm gardens and out along desert tracks. Donkey carts are the main form of transport, though they’re under threat from cheap Chinese motorbikes. The main industries are bottling spring water and growing dates and olives. My guidebook suggests that the town’s Bank of Cairo might be the world’s only bank made from mudbrick. It’s ATM coughed up cash and the clerk spoke good English. What more do you need? I miss my bike in Australia even more after we hired some sturdy but wonky beasts to explore with. The afternoon passed in a deliciously blurry breeze – skimming on rough tracks through the palm gardens, past hot and cold natural springs and chasing donkey carts loaded with shrouded women and children in bright silks, visiting relatives on the first day of the feast. At the temple of the Oracle of Amon, we listened for the clues to what Alexander the Great might have whispered to the Oracle before taking Egypt for his own. The Oracle wasn’t telling; she is sleeping in her hilltop fortress as life moves slowly amongst the palms below.